Kenya says that France's navy bombed a town in Somalia near a stronghold of al-Shabab, the first confirmation that a Western military force is involved in the latest push against the Islamist militia. Kenya on Sunday said that France's navy bombed a town in Somalia near a stronghold of al-Shabab, the first confirmation that a Western military force is involved in the latest push against the Islamist militia. Thousands of people, meanwhile, fled a camp for the displaced near Somalia's capital on Sunday, fearing an imminent clash between African Union peacekeepers and the al-Qaeda-linked militants who are trying to demonstrate their strength amid an assault on two fronts. In the country's south, others braced for fierce battles as Kenyan soldiers closed in on a militant-held town in their weeklong effort to defeat the al-Shabab group blamed for suicide bombings, kidnapping foreigners and killing famine victims. Kenyan forces last week moved into Somalia to fight al-Shabab, and on Sunday confirmation emerged that the East African country is receiving help in the fight from a Western power. U.S. officials told AP last week that the United States had been pressuring Kenya to "do something" in response to a string of security incidents along the Kenya-Somalia border, but that Kenya's invasion of Somalia took the U.S. by surprise. The U.S. has carried out precision strikes against militants in Somalia in recent years, but has not been involved in any wider military action since pulling out forces shortly after the 1993 military battle in Mogadishu known as "Black Hawk Down." Chirchir said fighting was likely to occur in the town of Afmadow "very soon." Afmadow lies near Kismayo. "Most likely man-to-man battles will occur in Afmadow," he told The Associated Press. "That is one of the areas we really want to inflict trauma and damage on the al-Shabab basically to reduce their effectiveness completely so that they do not exist as a force." Hundreds of residents were fleeing Afmadow Sunday in anticipation of fighting. Chirchir said al-Shabab were regrouping in the town of Bula Haji to face the Kenyan troops. Somalia has been a failed state for more than 20 years, and the lawless country is a haven for pirates and international terrorists. Al-Shabab fighters have been waging a war against the weak Somali government for more than five years, but now face attacks on two fronts. A force of 9,000 African Union peacekeepers from Burundi and Uganda have been aiding the Somali forces. Al-Shabab retreated from Mogadishu amid a devastating famine a few months back, but re-emerged by staging their deadliest single bombing that killed more than 100 people. African Union forces already have pushed the militants from their last base in the capital of Mogadishu, and those staying on the outskirts said they worried the battles were approaching. The African Union Mission to Somalia force, also known as AMISOM, said in a statement Sunday they had advanced to Mogadishu's outskirts. "We want to pass here before the fighting closes the escape routes," said Salado Abdullahi, a mother of six, who was at a checkpoint in Mogadishu on Sunday. On Sunday, a suicide bomber killed himself and wounded two AU troops when he ran after the AU convoy. 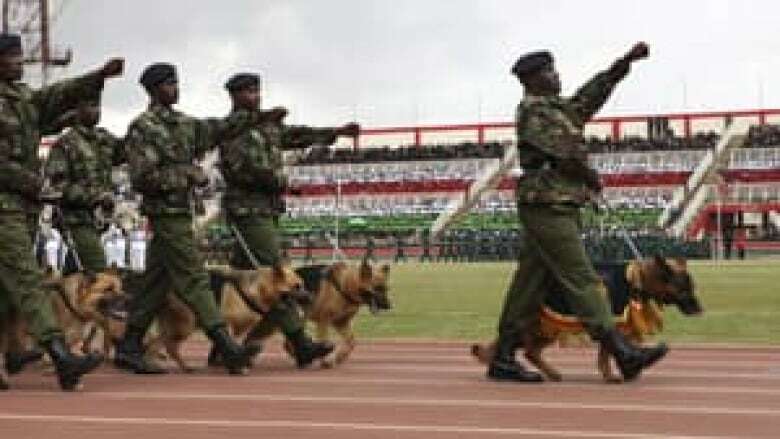 The Kenyan military sent troops into neighbouring Somalia one week ago to pursue the militants following a string of kidnappings on Kenyan soil that were blamed on Somali gunmen. Al-Shabab has threatened to launch suicide bombings inside Kenya in retaliation, and the U.S. Embassy warned late Saturday that an imminent terrorist attack is possible. Somali gunmen have kidnapped four Europeans in the last six weeks — two from Kenya's Lamu coastal resort region and two from the Dadaab refugee camp near the Somali border. One of the hostages, a quadriplegic French woman, died on Wednesday. The kidnappings have threatened Kenya's tourism industry, which had only recently bounced back from a near collapse after post-election violence left more than 1,000 dead several years ago. Kenya's troops are untested and it isn't clear if they are prepared for a long-term occupation requiring counterinsurgency skills — a scenario that ended U.S. and Ethiopian interventions during Somalia's 20-year-old civil war. The Somalia operation is Kenya's biggest foreign military commitment since independence in 1963. However, al-Shabab has been weakened by a severe famine in its strongholds. Al-Shabab also is beset by internal divisions and public discontent over the group's strict punishments, recruitment of child soldiers and indiscriminate bombings.